Trumpeter swan, Wrangell - St. Elias National Park, Alaska. 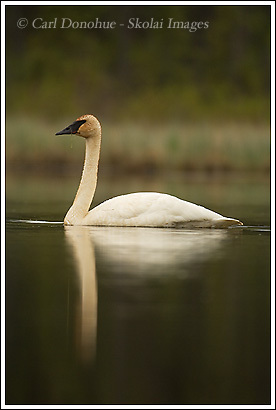 Trumpeter swan, Wrangell – St. Elias National Park, Alaska. Continuing with the bird theme again, here’s a trumpeter swan I found on my recent travels. The trumpeters were the first birds I saw back in the park as spring began, 2 of them actually swimming on the Kennecott River as it first opened up. Once the river is ice free, it becomes a silty chocolate brown color, and quite a raging river, the last place a swan might frolic. But early on, as the first ice melts back, the water is a deep aqua blue, clear and cold, and not as torrential as it becomes in the summertime, once the glacial melt increases. So I was kinda surprised to see trumpeter swans there early on. Then I saw them on the ice, from where I posted a photo or 2 a month back. Now the ponds are all open and the swans grace their way along the surface (I know, ‘grace’ isn’t a verb, but it sounds nice). They’re definitely an awesome bird. This entry was posted in Alaska, Birds, Wrangell - St. Elias National Park on June 14, 2008 by Carl D.